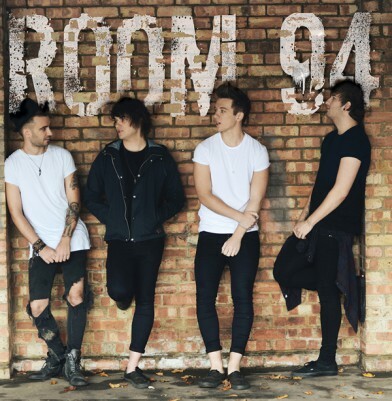 The first time a lot of people heard of Room 94 was when they supported Union J on tour. Whilst they projected an image of innocence and a clean-cut reserved style, it was clear that they were holding back something raw and strong. It was only a matter of time before their sound would break through and hit the airways with a nostalgic yet modern clash. The Hertfordshire based band, is due to release their latest self-titled album, stringing together a variety of rock songs pricked with the finest mix of styles, from pop to techno. What’s fundamentally great about this album is its way of packing in more than just one style of the genre. There are tracks which are bold: some that are rusty, and others that are downright explosive. But then Room 94 tantalises us with slow, melodic and acoustic-orientated tunes which are wistful and lyrical. What’s more, added to the arrangement of bass, drums, and guitar have been interposed synth sounds and sound effects, added to create authenticity and flavour to their songs. Comparatively similar to bands such as Lower Than Atlantis and Mayday Parade, the lyrical and vocal quality is truly impressive. Like heroes of modern rock, their music adds to a genre forever growing with new bands. The album shows off loose sounds which are no problem to dance to. In fact, the songs are perfectly suited to gigs because they’re ideal to play in big crowded rooms where the audience is off their feet, head-banging to guitar riffs. ‘So What’ and ‘Dirty Dancing’ use the sound effect of an old record player, infused in the intro. What’s different between the two is that where ‘Dirty Dancing’ is peppered with sharp beats and finger clicks for a suave sound, ‘So What’ is a dramatic opposite, full of raving teenage angst. ‘Tell me what love feel like’ is an example of focused instrumental prowess, whereas ‘Party Anthem’ certainly lives up to its name; the chorus of vocals at the start is anthemic. It’s also the one time within the song that they come close to sounding like My Chemical Romance. If you’re looking for a softer sound, Room 94 takes this into account, releasing ‘Your Song’, a track likely to feature in the score of a bitter-sweet romance. You’ve got to be thoroughly in adoration of an album to believe its quality is up there with some of the greatest pop-rock/ rock bands out there. Just as with any band you’re more than likely to come across tracks that do little favour for the album. ‘X’s’ is one of those tracks. The backing track to the narrated voice sound more like a Spotify advert than anything else, and not only can it be considered annoying, but boring also. It’s a shame this is the case since the chorus is beautifully created, but it’s more than likely that fans will turn a blind eye to the track, skipping it without having listened to the golden chorus, which is brimming with a jamming tempo. The chorus is ultimately the most profound part of Room 94’s music. They’re forward and catchy and effectively give Room 94 a right to calling themselves rock artists. Despite the one disappointing track, which in fairness, can be expected from any artist’s album, the album is rich with control and it’s pairing of the lyrics and melody. If rock music is your thing, it’s definitely worth checking out this album: there’s definitely a song for every rock enthusiast here, even for those who can just about tolerate it.